There are many more squares on the back, I didn't take a picture. If you have been wondering where I've been, I'll tell you. The day after arriving home from our island paradise, I went to work on a new project that I have been spearheading for our Desert Mountain community. The project came to me just before leaving and I embraced it as a community service project. A friend of mine, has a friend who is well loved in our community and was diagnosed with stage 4 cancer. Long story short, I decided that this was an opportunity for my quilting group to give back to our community in a way that made sense for us. Chemotherapy patients get chilly while under going treatment, so, I decided our group would make a personalized blanket. Before I left to Jamaica, I cut over 100 plain white squares and purchased fabric markers, gave them to my friend to disperse to family and friends of the patient. My group started putting the squares together, and when I arrived back to DM I finished up the quilt, sewing the squares all together. Last night I finished the quilt with hand sewing the binding and delivery to my friend. During this process, I learned a lot and will give these tips to you. Patterns- Since you will likely be limited on time to get a quilt done, you will probably want to go with a simple pattern. Charm squares and layer cakes but sometimes also fat quarters are easiest. Using pre-cuts will give a nice variety of a fabric collection and will also save you lots of time cutting. Since you do not wash pre-cuts until the project is completed, you will also save time washing and ironing the fabric. 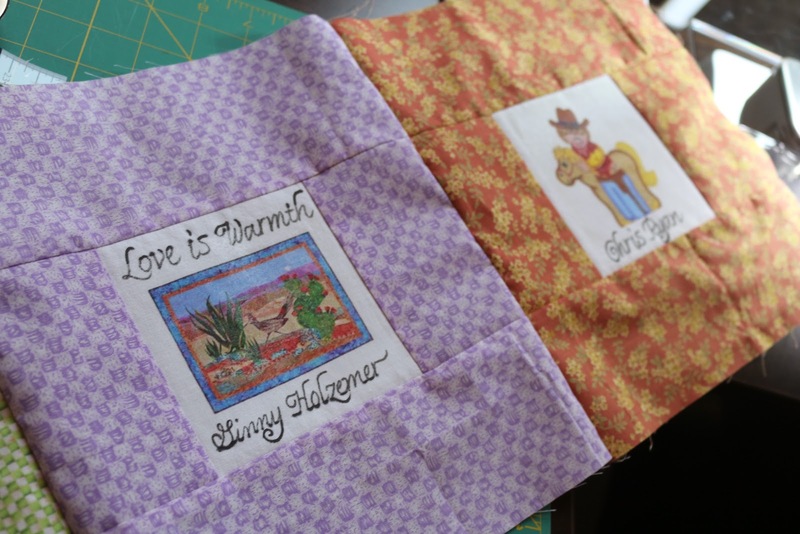 Quilt materials- Cancer patients are often very cold while going through treatment. Minky or cuddle fabrics would be a great backing to provide the patient with warmth and comfort. Use a quality batting, such as Warm & Natural. A punched cotton batting will hold up well. If you want to make a fleece or Minky blanket instead of a quilt, two layers sewn together with the binding will help retain the heat and provide extra weight. Durability- The quilts will go through many washings during treatment. It needs to be able to be washed in hot water in order for it to be sanitized. Avoid using red colors, which may bleed, or dark colors such as black and dark blue which may fade after multiple washings. you can use a color catcher or dye fixative such as Retayne to keep the colors from bleeding. Cancer Ribbons- Some breast cancer patients want nothing to do with pink, pink ribbons, angels, or anything that is a reminder to them as to what they are going though. If you are unsure, ask the patient how they feel about it before buying the materials. There is a long list of ribbon colors on Wikipedia, just click this link for colors and their meanings. Personalization- Sometimes there isn’t a lot of notice before someone we know starts cancer treatment. You may want to get a quilt done quickly so that it can be gifted to the patient before treatments begin. However, if you have a little bit of time before giving the gift, you may create a memory quilt and have friends and family members sign the quilt with inspiring messages. 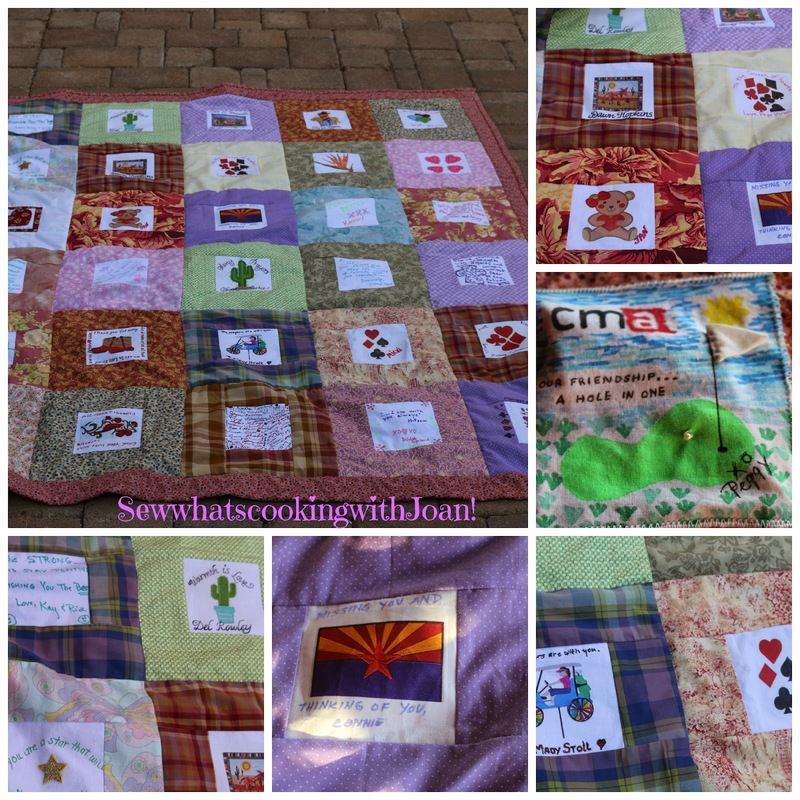 Other ideas for chemo patient care packages- You can also make a large bag that the quilt will fit in with all the supplies for a 5-6 hour treatment. A slim expanding file folder, business card folder, notebook/journal, fun pens, iTunes gift card, extension cord (for iPad), hard candies (sugar-free Jolly Ranchers, Werther’s, mints, honey-lemon lozenges), Smart water, water flavorings (Crystal Lite packets, Mio water flavor drops), assorted hand lotions, various teas (Smooth Move, Ginger, Peppermint) crystallized ginger, lip balm or a tea kettle and pretty mug, comfy cozy lounge pants, warm hat, t-shirts or a zip front hoodie. There is so much you can do to help. Think about your strengths and what YOU can do...everything helps! You could make a pot of vegetable soup or a pan of veggie lasagna and freeze in single servings. you can also cook some frozen fruit, then re-freeze it in ice cube tray.The frozen fruit cubes come in handy if the white blood cell counts go low, and the patient wants to make a smoothie. 2,752 Most of these views were of this post! I was shocked. Beautifully done, I sure her family will cherish.